Available at our disposal is an extensive range of Kids Western Outfit (Cheek Doll) that can be availed by the clients in an array of colors and striking patterns. Besides, our tailoring experts are efficient in benefiting the clients by providing variations in colors and finishes that are visibly attractive, as per the specific requirements of the customers. We are engaged in providing supreme quality Girls Barbie Outfit to the clients in a wide spectrum of colors, sizes and designs. Besides, the array can be effectively altered by our efficient workforce as per the exact specifications of the clients. This ensures the optimum satisfaction of clients as they are benefited with a perfectly fitting garment. We are engaged in providing supreme quality Kids Designer Outfit (FILMINA) to the clients in a wide spectrum of colors, sizes and designs. Besides, the array can be effectively altered by our efficient workforce as per the exact specifications of the clients. This ensures the optimum satisfaction of clients as they are benefited with a perfectly fitting garment. 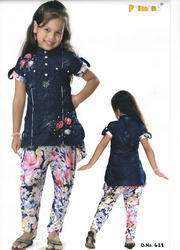 Looking for Kids Western Outfits ?